Life is interfering with blogging again. This is a clear example of the well-known principal that sufficient immersion in any activity prevents one from blogging about it as it happens. It is only after prolonged immersion, that ideas force themselves to be expressed. Currently, we are experiencing a rush of custom picture framing business and it is taking up my every waking minute. Fortunately, my wife Gretchen has been able to lend a hand in keeping things organized. She actually freed things up enough that we were able to attend a July 16 Business After Hours event sponsored by the Floyd Chamber of Commerce. 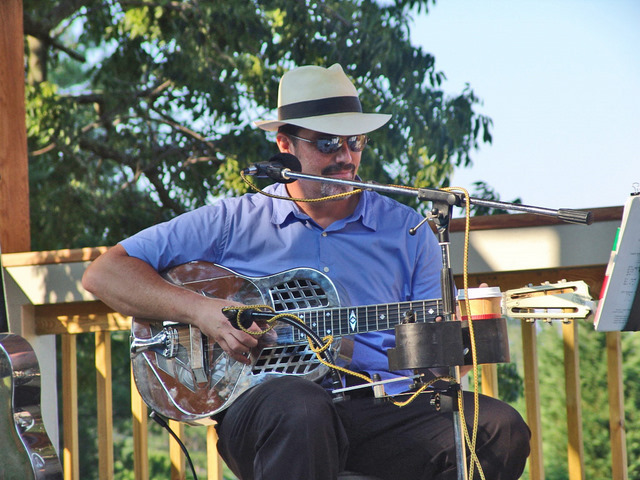 This month’s event took place at the Hotel Floyd amphitheater with hors d’oeuvres provided by Chef Scott Hutchinson and music provided by acoustic blues and roots performer Scott Perry. It is one of the few times I get to see the other small business owners of this county. We all have a great time swapping notes. It appears that most of us are having to work harder to overcome rising costs and to attract new business in the face of a continuing drop in discretionary income. The saving grace is that people still want and need things to celebrate life or to deal with the problems of life and it is a matter of providing customer experiences that encourage customers to visit and have their choices validated. If a small business can make a customer feel good about a transaction or series of transactions, that is good for all concerned. The challenge is to provide that service or product in a way that allows the business to prosper. How do we provide excellent customer experience and make enough profit to continue doing so? This entry was posted in Basic Business Concepts, Seen around Floyd and tagged discretionary income, Floyd Virginia, Hotel Floyd, Scott Perry, visitfloyd.com. Bookmark the permalink. Interesting, I never saw any advertisements for this event, nor were any of us on the lower side of town informed of it. It appears to have been a good event according to a few that have gone, but the Chamber may want to look into informing the business owners a little better. Thanks for letting my ugly mug grace your blog David! I really appreciate Derek and the Hotel Floyd hiring me for this event. I hope more local businesses follow their lead in supporting (hiring), and valuing (paying), local musicians.